All transactions are safe and secure with a reliable history in online purchasing behind each of our associates. 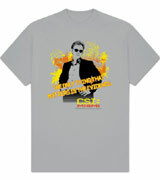 Buy the CSI Miami Horatio t-shirt to own CSI clothing and merchandise. The yellow, orange and black design on the front of this tee features Miami's most popular crime scene investigator, Horatio Cane (David Caruso). Overtop of the silhouette of the character is the quote, "The only thing that matters is the evidence," and the logo for the TV show that makes crime scene investigation glamorous. This piece of CSI apparel is a great gift for any fan of the TV series, especially if you often find them practicing their chalk outlines. In addition to the CSI Miami Horatio tee above, browse the CSI Clothing Gallery for more apparel like men's and women's clothes, kids shirts or hoodies.